Three years ago researchers helped to discover water on the surface of the moon. 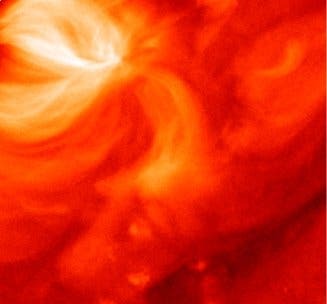 Now, they are piecing together the origin of that water: solar wind, the continuous flow of charged particles from the sun. Scientists have speculated it to be responsible for water on the surface of the moon. in 2011, Larry Taylor, distinguished professor in the Department of Earth and Planetary Sciences at the University of Tennesse, confirmed comets as the source for water inside the moon. This year, Yang Liu, research assistant professor, and Taylor have confirmed solar wind as the source for water on the outside—by depositing positively charged hydrogen atoms, or protons, onto its surface, allowing it to combine with the moon's oxygen to create water. "When those protons hit the lunar surface with enough force, they break apart oxygen bonds in soil materials to join together and form water," said Liu. "This does not happen on Earth because our atmosphere and magnetic field protect us from being bombarded by these protons, but the moon lacks this protection." The researchers used lunar samples from three Apollo missions, including one brought back by Neil Armstrong, analyzing something called an agglutinate. An agglutinate, which resembles "dirty Swiss cheese," is a unique product of space weathering in the lunar regolith, the crushed materials on the moon's surface. The agglutinate was chosen because it consisted of products suspected to contain hydrogen. The researchers used infrared spectroscopy to confirm the presence of hydroxyl (OH). Then they used secondary ion mass spectrometry to obtain the amount of hydroxyl and the origins of the hydrogen. The researchers discovered that most of the water in the agglutinates came from solar wind. Confirming the solar-wind- induced hydroxyl emphasizes the possibility of finding water on the surface of other similar airless bodies. The research also identifies the largest reservoir for water on the lunar surface since regolith, and thus the corresponding hydroxyl is very widespread. This gives the moon the potential to serve as a habitat and gas station in the sky. "The hydroxyl in such a volumetrically large reservoir is a valuable resource," said Taylor. "With the cost of $25,000 for taking one pint of water to the moon, water has the potential to be used as rocket fuel as liquid hydrogen or oxygen."